Don't have a Clickbank ID? Dr. Mauro and his staff work to create high quality products, along with original bonuses, follow ups (via email and post) to ensure customer satisfaction (see point 8 on the left). Hi I'm Dr. Karlo Mauro. 1) 4% Conversion Rate on Warm Leads: When I first promoted this site to my list of local patients, it converted at 4%. So if you have a mailing list that you have built a relationship with, you should expect a nice return. E.g. if you have a list of 10,000, that would produce 400 sales, at $16.61 commission a piece (after Clickbank's fees), totaling $6,644. 2) Free 7 Part Series: Instead of having to drive people to a sales page to buy something, you can more easily send them here by promoting our free 7 part series. It provides valuable information for avoiding constipation. We are giving away what many of our competitors are selling -- which only emphasizes to the prospect how much more valuable our product is. 3) 50% Commission: At the moment of writing this, the cost of the 37 Home Remedies For Women pdf download is $37. We also offer an additional product on the order page... Constipation Relief Recipes ($27). The combo price for both of them is $54. Approximately half of the people who purchase, buy the combo pack. The other half, just buy the 37 Remedies. After Clickbank's fees, you'd get 50% of $33.22 (just the 37 Remedies) which is $16.61 and 50% of $48.95 (combo) which is $24.48. 4) Clickbank Third-Party Tracking: If you already have an affiliate ID with clickbank you're set to go. Clickbank handles all the tracking and payment (not us). You can trust that your lead generation efforts will be properly compensated. 5) New Flow of Creatives: Our copywriter and designer has produced banner ads for your website, email templates for your list, brandable free reports you can distribute, and reprint articles for your ezine or blog that you can use. We are into value-packed marketing. We like to make sure your prospects benefit in some way from reading our promotions, so that they'll look for more. We also focus on creating above-average products, so that we can expand the "free-line" and give more away in our promotional material. 6) Special JV Arrangements: If you have a large list we are willing to do special promotions, teleseminars and other events to help maximize your commissions from selling our product. 7) Unheard of Low Refund Rate: Since launching this website in 2007 I have an extremely low refund rate of 4.28%. My staff and I work very hard to keep customers satisfied. Not only do they receive an exceptional thorough ebook with little known techniques for relieving constipation, they also receive a series of original bonus gifts. Included in those gifts is a 30-part, 90 day automated coaching series. This series ensures they make full use of the product and reminds them of the benefits. This also keeps them onboard past the 60-day refund period with Clickbank. I also send a physical greeting card with a thank you note and a link to a online video presentation. We do everything we can do to make our customers feel like WE got the short end of the stick and make our price insubstantial. 8) Credibility from a Fully Licensed Doctor: There are many health information products out there by people with little or no formal education. I am a fully licensed Naturopathic Doctor from the Canadian College of Naturopathic Medicine. Our website prominently displays my credentials of 10 years of university studies, earning 4 university degrees. 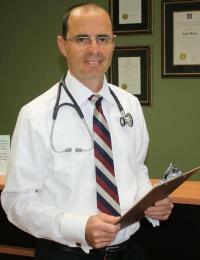 I have been running a naturopathic clinic for 13 years specializing in gastrointestinal health. All this adds up to a higher level of trust from prospects and increased sales commissions for you. I'd strongly encourage you to enter your contact information below so that I'll be able to stay in frequent contact to help you achieve maximum benefits from our affiliate program. Copyright © 2007 - 2013 Dr. Karlo Mauro, N.D.